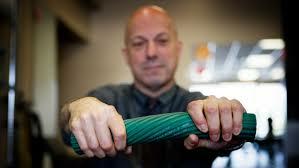 Tennis elbow is a condition which is known medically as lateral epicondylalgia. ‘Epicondyl’ refers to the anatomical landmark on the outside of the elbow and ‘algia’ refers to the presence of pain. With tennis elbow pain can be felt on the outside of the elbow which in some cases can spread down towards the forearm or wrist. Tennis elbow used to be known as epicondylitis with ‘itis’ referring to inflammation, but we now know that there is little in the way of true inflammation especially with persistent long term symptoms. Instead the source of pain comes from strain and overload on the tendon causing it to breakdown at a cellular level (ref). Tennis elbow starts when the tendons which run from the muscles on the back of the forearm into the elbow are overloaded or strained. This causes micro-tears in the tendon where it inserts into the elbow leading to pain. 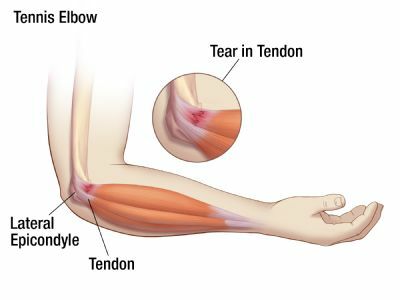 Tennis elbow can be brought on by an acute injury or sudden movement producing high forces through the tendon, but more commonly the onset is gradual over time with repetitive movements requiring lots of wrist and hand movement or gripping, e.g. gardening, cleaning, DIY, manual work or typing. How do I recognise the symptoms? There are a number of different things you can do to help yourself. The most important of all is reducing the weight that goes through the injury site, or the amount of work you are doing with your arm. Working through the pain is rarely advisable as this will continue to overload and place stress on the injured tissue. Other useful adjuncts for relieving pain include the use of analgesia such as paracetamol or non-steroidal anti-inflammatory medication. Using ice packs can also be useful for symptomatic relief of pain even though there may be little in the way of actual inflammation. You shouldn’t take ibuprofen or aspirin if you’re pregnant or have asthma, indigestion or an ulcer until you’ve spoken to your doctor or pharmacist. Medication can have side-effects so you should read the label carefully and check with your pharmacist if you have any queries. Always seek medical advice if needed before taking medication. A Physiotherapy assessment can help by pinpointing the cause of symptoms and ensuring you get an accurate diagnosis. Once this have been obtained an appropriate treatment plan can be put together. Physiotherapy treatments include using tape or straps which take pressure off the injured tissue and can be worn during activities that typically cause discomfort. Soft tissue massage, elbow mobilisation, acupuncture and shockwave therapy can also be used for pain relief and to promote healing. Long term management with specific strengthening exercises is strongly supported by research and this often forms the foundation of management in physio. If you don’t respond to conservative treatment your GP or physio may suggest a steroid injection could be of benefit. Injections can work extremely well for some and for others can have little impact. Your physio can help with referring you on for a steroid injection if they think you would benefit from this and discuss the pros and cons. Don’t just put up with symptoms – get the injury checked out! Whatever you do, don’t just sit and rest the injury. Rest on its own is rarely useful for persistent symptoms and if anything can lead to making things worse as the muscles and tendon loose strength. So don’t delay, book an appointment on 01462 431033 or contact us for further information on assessment and treatment. Click here for more information about Physio Three Sixty.